City and county law enforcement departments have new vehicles to assist them in their duties. Whether watching for criminal activities, performing a search and rescue activity, or any number of other special circumstances where either on-foot or standard vehicle use is impractical, the agencies now have brand-new ATVs at their disposal. Jim and Shelley Horn of J&S Auto Centre made the vehicles available through a Bombardier program. 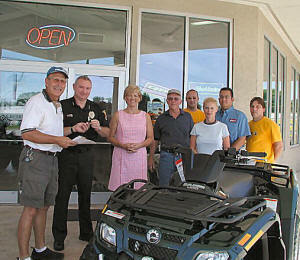 Pictured as the city received its ATV are (from left to right) Jim Horn, Police Chief Robert Rawlins, Mayor Elizabeth Davis, Edgar Alley, Doug Luken, Shelley Horn, Ron Meyer and Perry Groves. Where can you find a good ear these days?